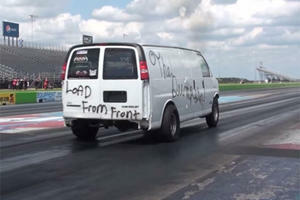 The Chevrolet Express is available with either a choice of V8s, a 285 hp 4.8-liter or 342 hp 6.0-liter or a fuel efficient 181 hp diesel engine. The gasoline models come with a 6-speed automatic while the diesel gets an 8-speed unit. IT is an old design and basic specification and safety levels are low but the availability of two-wheelbase options, numerous seating configurations and a cargo variant means the Express is a versatile load hauler. Notable options are a rearview camera and satellite navigation system. The Chevrolet Express is a full-sized van capable of being set up in a number of configurations in either regular or extended-wheelbase form to provide seating for up to 15 occupants or be a cavernous load-lugger. Its shape looks familiar partly because it is a very popular choice in this segment and partly because it has changed very little in its very long production life. It may not offer the latest in refinement and technology compared to its competitors and not much has changed for the 2017 model year either. The very basic dashboard design gives the Express’ age away as soon as you step inside. The standard vinyl trim is utilitarian although the available cloth upholstery and power front seat options can help increase the comfort levels. Huge swathes of hard touch plastic trim pieces complete the interior ambiance. There is no denying the huge space available in the Express Passenger variants, cup holders and storage space is plentiful. Whether in the 12-seat regular or 15-seat extended-wheelbase versions the leg and headroom is more than adequate. Although when equipped with the full complement of 15-seats there is very little cargo space left in the back. The lack of a high roof option means that occupants will have to bend down to get into the rearmost benches too. There is also an Express Cargo version which removes all of the extra seating save for the front row and offers a cavernous cargo area. The Express rides and handles as one would expect of a full-size passenger van, in other words it does not like to be hurried along. Sharp direction changes upset its composure but in most normal driving conditions it is a capable cruiser. The ride improves with a load on board, although it is generally quite adept at keeping the bumps and thumps over poor pavement to a minimum. The base engine is a 4.8-liter V8, providing 285 horsepower and 295 lb-ft of torque it provides decent performance. A 6.0-liter V8 with 342 hp and 373 lb-ft is optional and both drive the rear wheels through a 6-speed automatic transmission. Fuel consumption is claimed to be nearly identical for both V8s although if efficiency is a priority then the available 4-cylinder diesel engine with 181 hp and a strong 369 lb-ft of torque may be the better bet. This engine is effectively a replacement of the older diesel unit is also fitted with an 8-speed automatic transmission which should hopefully help keep the aging Chevrolet Express relevant for a few more years. 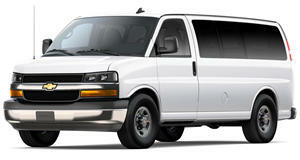 The Chevrolet Express Passenger van is available in either base LS or LT trims. Two load ratings are also offered, namely the 2500 and 3500. The 3500 is available as a long-wheelbase model which allows for up to 15 occupants. The 2500 is fitted with 12 seats. LS models are equipped with 16-inch wheels, air-conditioning, OnStar emergency services, 2-speaker audio system and power windows. 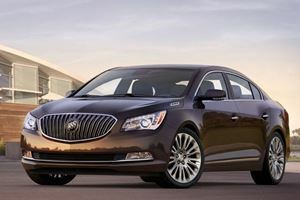 Safety features include a stability system, ABS, airbags and tire pressure monitoring. 3500 models also come standard with a tilt steering wheel and cruise control. LT models offer cloth upholstery, remote locking, tilt steering wheel and cruise control for the 2500 and rear air-conditioning. Optional extras depend on the body type and trim level and some of the more notable items are rear parking sensors, locking rear differential, power adjustable front seats, satellite radio with WiFi hotspot. A Paratransit package for 3500 models removes the rearmost row of seats. The Chevrolet Express is a rugged workhorse ideal for transporting up to 15 occupants, it is lacking in technology and modern safety devices but it remains popular and its generous dimensions and available diesel engine may help keep shoppers interested a while longer. Because that’s the sort of thing you expect to see. Neither is a performance standout, but they do offer plenty of trunk space for golf clubs.